A journey of giraffes is wonderful to see in the wild. There is plenty of time for photography and writing because the giraffes stop and stare at me with their soft beautiful eyes. I noticed the Oxpecker birds who ride on the giraffe’s back and groom them. They also enter the giraffe’s mouth and pick their teeth. 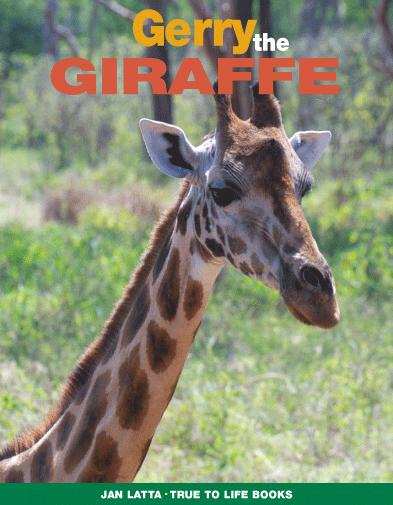 It was a challenge to record all the different patterns of the African giraffes, so I’ve included the two main patterns in the book. In 2005 I had the unique experience of seeing a white giraffe in Tanzania. He was so beautiful with a just a few tan spots on his back. I have never heard a giraffe make a noise until recently when a male made a ‘horsey’ sound by blowing through his lips. I noticed all the hairs on his mane were vibrating. This is why it is so important to be close to animals in wild to tell their story. The concept for the book is the giraffe talking to children about its life in the wild and how it can survive. There are maps, interesting facts and fun activities. See this video of giraffes in the wild.